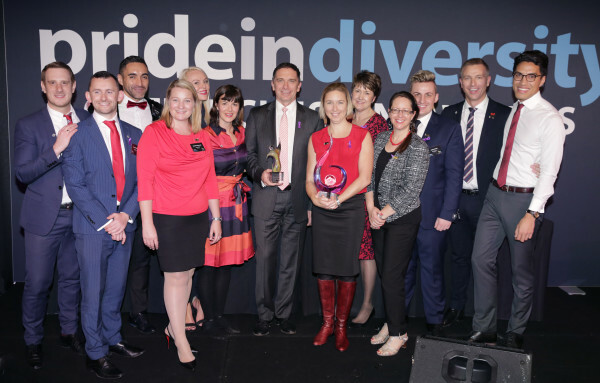 Westpac Group has been named Australia’s 2016 Employer of the Year for LGBTI inclusion for the first time at a special event held in Sydney by ACON’s Pride in Diversity (PID) program, a national not-for-profit employer program for the inclusion of LGBTI people in the workplace. Employer of the Year heads an annual list of Top 20 employers for LGBTI inclusion determined by assessment against PID’s Australian Workplace Equality Index (AWEI), a benchmarking instrument that evaluates LGBTI inclusivity against a comprehensive set of measures in addition to a body of supporting evidence submitted by the employer as part of the evaluation process. Along with some truly significant achievements in 2016 by a range of organisations ranging from banking and finance, renewables, telcos and IT, the Australian Federal Police receives the honour of being the highest performing public sector organisation. Uniting is the highest ranking not-for-profit/charity and the NSW Police, in only their first year in the index, has achieved an 11th placed-ranking as well as receiving an award for transgender inclusion. Other awards at the luncheon included: LGBTI Employee Network of the Year (Commonwealth Bank’s UNITY); Innovation Award (Accenture); Highest Ranking University (The University of Western Australia); Achievement Award for Most Improved (Clayton Utz), Highest Ranking Small Employer (Key Assets – The Children’s Services Provider), Small Employer Award (Domestic Violence Service Management NSW). Individuals acknowledged for their significant contribution to LGBTI workplace inclusion include Greg Ward, CEO Macquarie Bank (CEO of the Year); Supt Tony Crandell, NSW Police Force (Executive Leadership Award); Steve Rieniets, AGL (Regional Inclusion Champion); Brad Cooper, CEO BT Financial Group (Inclusion Champion); Melissa Tandy, ANZ (Sally Webster Ally Award); Suzi Russell-Gilford, PwC (Sapphire Award) and Rhiannon Kop, Aurizon (Out Role Model). A Platinum Tier status has been established for the first time this year, acknowledging organisations that have either retained a top 5 position at least 4 times within the last 5 years, or achieved employer of the year twice within the last 5 years. PwC and Goldman Sachs are the first organisations to qualify for the new Platinum Tier. Director of ACON’s Pride Inclusion Programs (which incorporates PID and the newly launched Pride in Sport) Dawn Hough said: “The AWEI has seen remarkable growth over the first six years of its life with this year seeing the most significant growth to date”. There has been a 46.6% increase in AWEI participation, 125% increase in first time submissions and a 48% increase in accompanying employee survey responses (n 13,393). Another noteworthy achievement for this year’s AWEI includes substantial growth in sector participation, including a 50% increase in private, 40% in public and 80% for Higher Education. Over 600 people attended the sold-out event at Doltone House in Sydney on May 20, emceed by Olympic Diver Matthew Mitcham. Speakers included PID patron the Hon. Michael Kirby and Paul Zahra, PwC Diversity and Inclusion Advisory Board Member and former CEO of David Jones. “Pride in Diversity congratulates all award winners recognised today on their significant achievement and for showing great leadership in the area of diversity and inclusion.” Ms Hough added.